For the smaller mountains to the east, see Dabie Mountains. The Daba Mountains, also known by their Chinese name as the Dabashan,[a] are a mountain range in Central China between the watersheds of the Yellow and Yangtze Rivers. Part of the larger Qinling mountain range, it cuts through four provinces: Sichuan, Chongqing, Shaanxi, and Hubei. It is about 1,000 kilometers (620 mi) long. 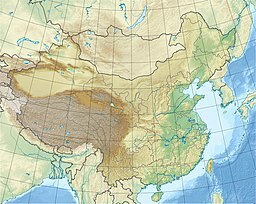 The Daba Mountains run in the general west-northwest to east-southeast direction, along the border between, on the one side (southwest and south) Sichuan and Chongqing, and on the other side (northeast and north) Shaanxi and Hubei. The mountains of Shennongjia are often considered the easternmost section of the Daba Range. The Daba Mountains' highest points are in the Shennongjia massif in Shennongjia Forest District. The three tallest peaks, located west of Muyu town, are Shennong Deng ("Shennong Peak", 3,105 meters (10,187 ft) elevation), Da Shennongjia ("Great Shennongjia", 3,052 meters (10,013 ft)), and Xiao Shennongjia ("Lesser Shennongjia", 3,005 meters (9,859 ft), on the district's border with Badong County). Laojun Shan, 2,936 meters (9,633 ft) tall, is located northeast of Muyu. The natural landscape of the region, the Daba Mountains evergreen forests, is listed by the World Wildlife Fund (WWF) as one of the world's 200 ecoregions that should be a priority for conservation. Dabashan National Nature Reserve is located in the Chongqing part of the Daba Mountains (Chengkou County); Shennongjia Mountain Nature Reserve (704 square kilometers (272 sq mi)), in Hubei (Shennongjia Forestry District). Presently, terraced agriculture is expanded in the Daba Mountains. A widely planted cash crop is the Eucommia tree, a medicinal plant. ^ In the 19th century, the range was also known as the Kew-lung[why?] or Po-mung. The latter name refers to Mount Bozhong, the source of the Han River. In Chinglish sources, the range is also sometimes referenced as "Mount Daba" or "Daba Mountain", owing to confusion arising from the general lack of plural forms in Chinese. ^ "China", Encyclopædia Britannica, 9th ed., Vol. V, 1878 . ^ a b c "Daba Mountains evergreen forests". Terrestrial Ecoregions. World Wildlife Fund. Retrieved 5 June 2011. This page was last edited on 6 April 2019, at 06:54 (UTC).